FILE - Myanmar's de facto leader Aung San Suu Kyi delivers a televised speech to the nation at the Myanmar International Convention Center in Naypyitaw, Myanmar, Sept. 19, 2017. A Nobel Peace laureate, she has been criticized for not doing enough to resolve the Rohingya crisis. Myanmar's leader Aung San Suu Kyi is the latest in a long line of Nobel Peace Prize laureates to disappoint many of those who once applauded her, and probably won't be the last, a cautionary tale for the 2017 laureate who will be named next week. Aung San Suu Kyi is facing international criticism, including from fellow peace prize winner Desmond Tutu, for not doing more to stop what the U.N. says are mass killings, rapes and the burning of villages taking place in Rakhine state. The violence has forced 421,000 Rohingya Muslims into neighboring Bangladesh. That is a turnaround from 1991, when the Norwegian Nobel Committee awarded her the prize and praised "her non-violent struggle for democracy and human rights". Once awarded, the prize cannot be withdrawn. "This has happened many times before that laureates have been criticized," said Professor Geir Lundestad, who was the secretary of the Norwegian Nobel Committee from 1990 to 2014. Lundestad said the prize remains a force for good, even if some winners later fall short of its ideals: "Aung Sang Suu Kyi was a very important spokeswoman for human rights in Burma and much of Asia. You cannot take that away from her." The Nobel prizes were established by Alfred Nobel, the inventor of dynamite, whose fortune came in part from making and selling arms. The peace prize, worth 9 million Swedish Krona ($1.1 million) will be announced on October 6 and can go to one or more individuals or organizations. Israeli leader Menachem Begin ordered the invasion of Lebanon in 1982, four years after sharing the Nobel with Egypt's Anwar Sadat for their Camp David peace accord. Sadat was assassinated by an Islamist army officer in 1981. Palestinian leader Yassir Arafat shared the 1994 prize with Israel's Yitzhak Rabin and Shimon Peres for the Oslo accords, which have not brought a lasting settlement to the Arab-Israeli conflict. Rabin was assassinated by a far-right nationalist in 1995 and Peres was voted out of office eight months later. Arafat later presided over the Palestinians during the second intifada, a violent uprising against Israeli occupation. 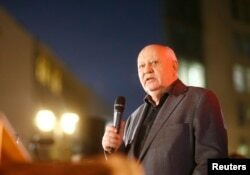 FILE - Former Soviet President Mikhail Gorbachev visits the former Berlin Wall border crossing point Checkpoint Charlie, in Berlin, November 7, 2014. Credited with overseeing the peaceful collapse of the Soviet Union in 1991, he has drawn criticism for opposing the independence of some former Soviet republics. U.S. Secretary of State Henry Kissinger shared the 1973 prize with North Vietnam's Le Duc Tho for what turned out to be failed efforts to end the Vietnam War. Tho declined the award, the only laureate ever to do so, accusing Washington of violating the truce. The war ended in 1975 with the fall of Saigon to the North Vietnamese. "I would be remiss if I did not acknowledge the considerable controversy that your generous decision has generated," he said in his speech. "I'm responsible for the deployment of thousands of young Americans to battle in a distant land. Some will kill, and some will be killed. And so I come here with an acute sense of the costs of armed conflict." Among Aung San Suu Kyi's critics is Tutu who, in a Septemer 7 letter to his "dearly beloved younger sister" writes: "If the political price of your ascension to the highest office in Myanmar is your silence, the price is surely too steep." On September 19, Aung San Suu Kyi condemned rights abuses in Rakhine state and said violators would be punished. While Western diplomats and aid officials welcomed the tone of her message, some doubted if she had done enough to deflect global criticism. "She has an aura," he said of Aung San Suu Kyi, adding that maybe her stellar international reputation "masked the true awfulness" of abuses over many years of the Rohingya. "When she responded to questions about the Rohingya by saying 'why are you focusing on them, not on other issues, people were inclined to give her the benefit of the doubt." Aung San Suu Kyi was the rare winner, like Nelson Mandela, to rise from political prisoner to national leader. Mandela stepped down after five years as South Africa's first black president with his reputation largely unblemished, but some of his allies from the apartheid-era liberation movement faced scandals in office. "Maybe it's this move from the image of the bold, heroic defender of human rights and ordinary people ... into what is inevitably a more grubby world of politics where compromises are made" that tarnishes reputations, said Smith. 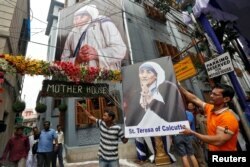 FILE - A man holds a poster of Mother Teresa outside the Missionaries of Charity building in Kolkata India, Sept. 4, 2016. A Nobel peace laureate and saint, even she has her critics. "It is a always a risk when they promote somebody, because they are getting involved in politics," he told Reuters. "And they cannot predict what is going to happen in the future." "That is what makes the Nobel Peace Prize different from all the other peace prizes," said Sveen. "Otherwise you would give the prize to very old people just before they die." The deal, which saw Iran agree to curbs on its nuclear program in return for the lifting of international sanctions, has been criticized by hardliners in both Tehran and Washington. U.S. President Donald Trump called it "an embarrassment to the United States" in a speech at the United Nations this month, and has suggested Washington could repudiate it. "This is the first time that a country subjected to Chapter VII [of the U.N. Charter] has seen its situation resolved peacefully," said Henrik Urdal, Director of the Peace Research Institute Oslo, referring to how Iran's nuclear program is no longer labelled a threat by the U.N. Security Council. "Focusing on the EU and Iran would also be a signal to the United States that the Iran nuclear deal has a broad support base," Urdal told reporters. Other possible contenders are Pope Francis, Syria's "White Helmet" rescue crews, the U.N. refugee agency UNHCR and its high commissioner Filippo Grandi. UNHCR has already won twice. Last year's prize went to Colombian President Juan Manuel Santos for his efforts to end half a century of war that killed a quarter of million people.